I am Mytria, Keeper of the Violet Flame on Alycone, Pleiades, and I am Mytre, Commander in the Ashtar Commander. We are Divine Complements and are one of the higher expressions of this writer. Uploaded on 16 May 2012 by TruthNeverTold / If you like this go to http://TheGreatestTruthNeverTold.com and Join Us. This is part 27 of the Youtube videos. 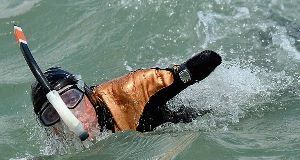 A Frenchman who lost his limbs in an accident braved strong winds and currents to swim from Papua New Guinea to Indonesia, in the first stretch of a mission to swim between five continents. Philippe Croizon, 43, who uses prosthetic limbs with flippers attached, took seven-and-a-half hours to make his way from the Papua New Guinea village of Wutung to Pasar Skow in Indonesia’s Papua province. Door-to-Door May Drive Irish Towards Yes Vote in Referendum on Merkozy Pact.